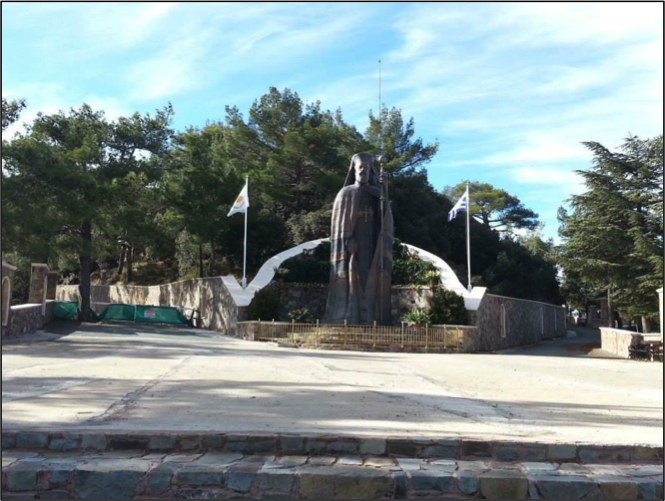 During the Modern Greek Studies' trip to Cyprus over winter break, MGS program director Dr. Stephanos Katsikas and student Alex Zoiopoulos were featured on the Cyprus Public TV channel's show, "Cyprus Near Us." The interview aired on January 22 and is primarily in Greek, with Zoiopoulos responding to the interviewer's questions in English. 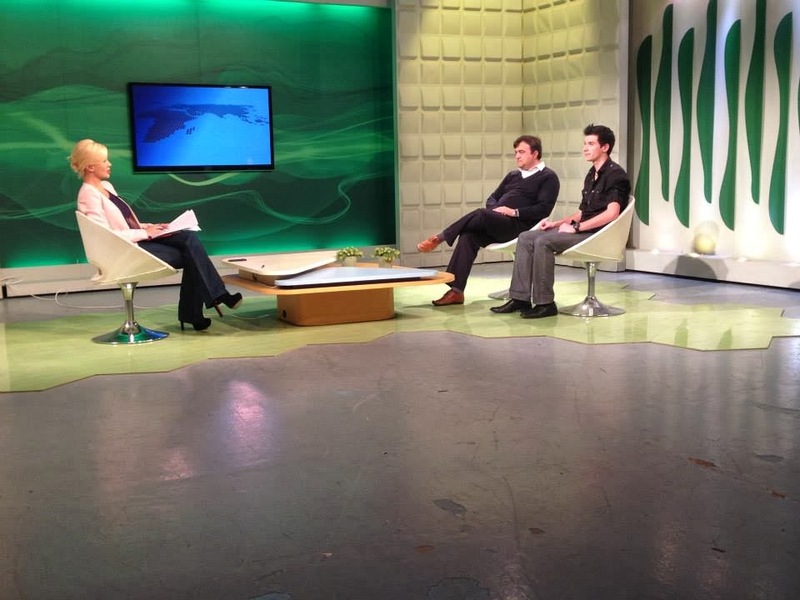 The interview can be viewed below or on the "Cyprus Near Us" website. More information about the Modern Greek Studies trip to Cyprus can be found on a previous blog post about the trip and on the MGS Facebook page for the trip. While many University students returned home for winter vacation and avoided the blistering cold by staying indoors, other students spent their break overseas and expanded their cultural knowledge. This winter, the University of Illinois Modern Greek Studies Program conducted a study abroad course to Cyprus, “Conflict and Post-Conflict Resolution in Modern Cyprus: Life and Culture Divided by a Wall.” Students traveled to the small island in the Mediterranean Sea and had the opportunity to explore the landscape and meet several important figures, such as the Christian Orthodox Archbishop, Chrysostomos II, and the Minister of Foreign Affairs of the Republic of Cyprus, Mr. Ioannis Kasoulidis. 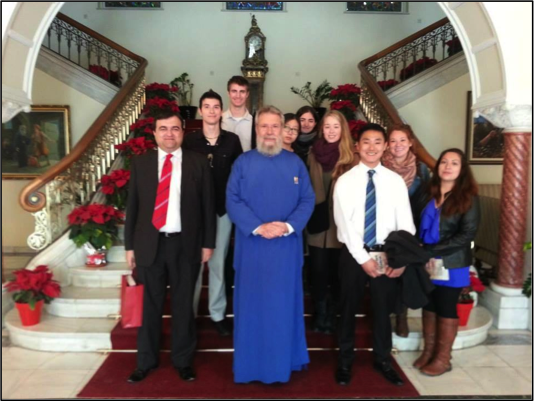 Not only did students in this program get the opportunity to meet prestigious people, but they also visited several notable locations, such as Throni — the tomb of Archbishop Makarios III, who was the first President of the Republic of Cyprus — and Paphos, the birthplace of Venus in Greek Mythology. The Modern Greek Studies program at the University of Illinois is dedicated to educating students about the history, politics, art and other important aspects of modern Greece. The study abroad program is a wonderful opportunity that allows students to better understand the multifaceted nature of Cypriot society. 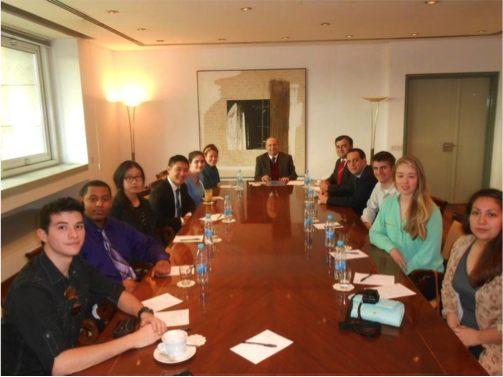 Photos courtesy of the Modern Greek Studies Program. On November 5, 2013, Dr. Mark Cole, Associate Professor of Law at the University of Luxembourg gave a talk on the University of Illinois campus hosted by the EU Center entitled “Territoriality, Jurisdiction and Exhaustion in Intellectual Property Law: Some Observations on Recent Developments in EU and US Law”. Despite its long and technical-sounding name, Professor Cole’s talk was both engaging and accessible. He described a series of cases decided by US and EU courts that together sketch out the contours of the recent changes in intellectual property law on each side of the Atlantic. Intellectual property law (or IP law) is the field of law that governs copyrights and patents. It’s the law you break every time you download a song or a movie without paying for it. It’s the law that Google and Apple and Microsoft and Samsung spend billions of dollars suing each other under, each company claiming that the others are infringing its patents. Whole political parties have been organized around it (US Pirate Party and International Pirate Party). And in 2012 the internet shut down over it. That is to say, IP law affects us every day. So it’s kind of a big deal that the US and the EU can’t always agree on how it works. Part of the problem is that our IP laws are hopelessly outdated. They were written in the pre-digital era, when music and movies and books existed as physical objects. Illegally copying movies involved connecting two VCRs together (anyone remember those?) Taping music from the radio was the closest thing to bit torrent. 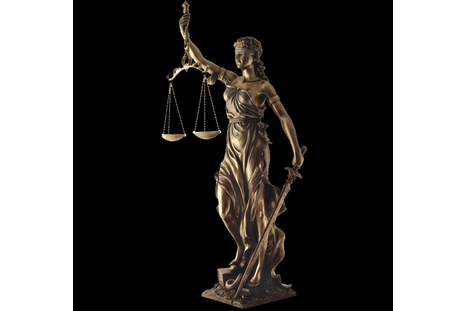 So both European and US courts have struggled to make sense of these laws today, when it’s perfectly possible for me to email a song to you, and with a decent internet connection it takes ten or fifteen minutes to download a feature-length motion picture. Also part of the problem is that IP protections are different in different countries, even within the EU. Say a French person recorded an album in the 1970s. It was sold on vinyl records. Then one day in the mid-2000s, our Frenchman decides to google his old record. It turns out that a company in Hungary has digitally copied the old vinyl record and is producing CDs of it. Those CDs are being sold to a company in the UK, which is selling them through the mail all across the EU. (This was a real case that Professor Cole described.) Which country’s IP laws apply here? 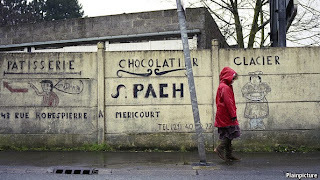 France’s, where the old man lives? Hungary’s, where the illegal CDs are being produced? The UK’s, where those CDs are being sold? You can begin to imagine the problems involved. Of course, the obvious solution to this problem would be to make IP laws the same everywhere. After all, if every court would give your copyright the same level of protection, and if every judge would impose the same sentence on someone who broke your copyright by illegally copying your music, then life would be much easier. But just try convincing Congress to adopt a European standard of protection (socialists!) or for that matter a European legislature to adopt the same standard as even another EU country (lazy Greeks! Evil Germans!). Maybe someday we’ll get there, but I don’t think it’ll be anytime soon. Levi Armlovich is a dual-degree Law & EU Studies student. He is writing his thesis on Turkish constitutional reform. Chairman of the Presidency of Bosnia and Herzegovina Željko Komšić addressed dual subjects in his remarks at the University of Illinois on October 1, 2013: the country’s hopes for accession to the European Union and the North Atlantic Treaty Organization (NATO), and the positive experience of Bosnian immigrants in the United States. Komšić began by recognizing western states for their intervention in the Yugoslav Civil War in the 1990s. This was an appropriate place to begin, as the two main topics of the talk were both rooted in the conflict. 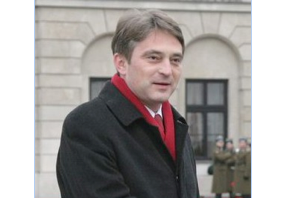 Firstly Komšić addressed two political aspirations paramount to the future of Bosnia and Herzegovina, which he described as being the only viable road for the nation. These are membership in the European Union and NATO. As those familiar with the history of the former Yugoslavia could have expected the ‘ethnic’ divide is the primary reason Bosnia and Herzegovina has not yet attained membership. Historically the friction between Serbs, Croats, and Bosniaks has been bitter and the source of considerable violence, first in the Second World War and then again in the 1990s. Bosnia itself is an embodiment of this divide, officially divided into Serb, Croat, and Bosniak populations, each with its own region and its own president. President Komšić, chairman of the three presidents, regards the tearing down of this divide as the route to membership in both the EU and NATO. He further addressed the issue of religion, upon which the ethnic divide is founded, identifying it as important to one’s identity, but not one’s basic human rights. g down the divide between the three religion-based ‘ethnicities’. Perhaps it takes immersion in another different culture for the three to recognize that they in fact more similar than different. Ultimately what President Komšić regards as the key to the future of Bosnia and Herzegovina is a civil rights movement comparable to the one in the United States in the middle part of the twentieth century. However, any comparison between racial segregation and the ethnic dissonance in Bosnia is a strained one. While, yes, segregation in the US was characterized by some degree of violence, it is not entirely rooted in hatred and genocide. With such indescribable violence as that at the Jasenovac extermination camp in the Second World War and the more recent atrocities of the Yugoslav Civil War so recently in memory, a wedge still exists, driven between the victimized ethnic groups. Ultimately the regime of Tito is to blame for this, having virtually swept the ethnic cleansing masked by the Second World War under the rug, rather than reconcile it, in hopes of unifying the communist Yugoslavia. Furthermore, in today’s Bosnia and Herzegovina, there exists the outside influence of nationalism. No doubt the extreme xenophobia characteristic of neighboring Croatia and Serbia feeds that of the respective communities within Bosnia and Herzegovina. In conclusion it is hard to imagine President Komšić’s dream coming to fruition. In a country officially divided along ‘ethnic’ lines and in which the Ekavian and Jekavian dialects of Serbo-Croat are claimed as entirely different languages by the ethnic groups they are endemic of, it is hard to imagine complete reconciliation and cooperation. Chris Jackson is a first-year MA student in European Union studies at the University of Illinois and a graduate assistant in the European Union Center. His research interests include nationalism, European Security and Defense Policy, and the EU in Southern and Eastern Europe. Chris graduated from Centre College (KY) in 2012 with a BA in History. 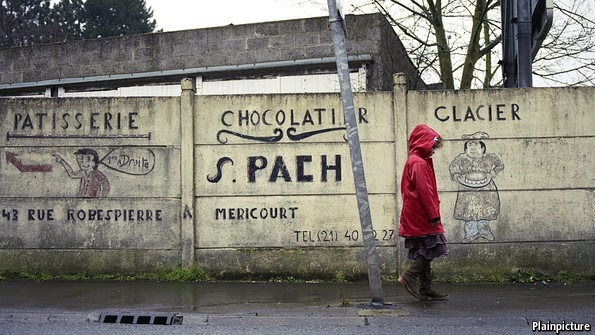 The European Union Center's faculty affiliate, Professor Jean-Philippe Mathy, was included in a recent article in the Economist, entitled "French Culture: Bleak Chic." The article explores France's relationship with and ostensible entrenchment in misery and references Professor Mathy's book, "Melancholy Politics: Loss, Mourning, and Memory in Late Modern France," in which he argues that France's pessimism stems from the country's realization that it is becoming indistinguishable from any other given country, that it is slowly sliding into unexceptionalism. 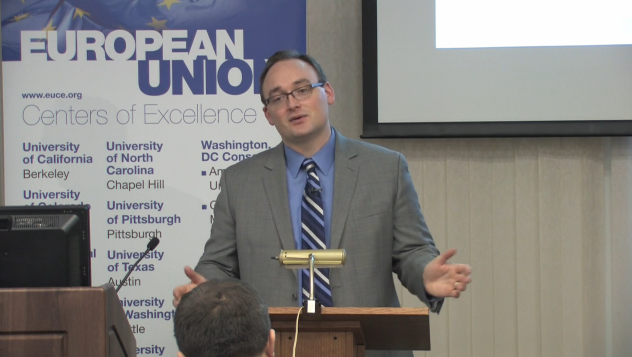 Professor Mathy also recently participated in the University of Pittsburgh's videoconference "Conversations on Europe" roundtable discussion, "France as a Global Leader." 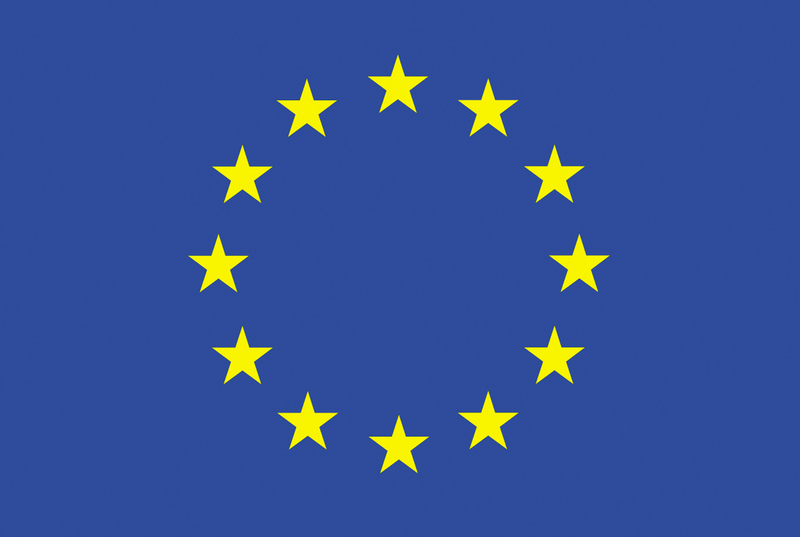 The EUC blog post about the conference can be read here. On November 1, Professor Timo Goeschl, chair of Environmental Economics at Heidelberg University, gave a guest lecture at the University of Illinois about the climate policy hold-up. During his lecture, the findings from one of his latest research papers were presented. These findings provide a negative outlook for future International Environmental Agreements such as the Kyoto Protocol, which entered into force in 2005 and was signed by a big majority of countries (http://unfccc.int/kyoto_protocol/items/2830.php). Furthermore, not only are these agreements more difficult to reach, the incentives for companies in industrialized countries to develop green technologies (replacing old existing technologies by new, more environmental friendly technologies) - sometimes referred to as ‘Green Gold’ - is less present. It is the combination of these two arguments that leads to a pessimistic view concerning a more green future. Or is there still hope? In order to arrive at his results, Professor Goeschl used a model that has proven its validity in other fields as well. 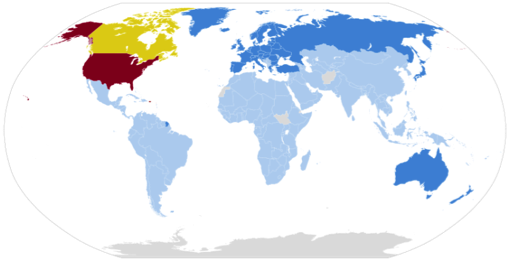 Based on a number of premises (including in particular that a country will only join an international environmental agreement if it is their own interest), the cost and gains per country of joining an environmental agreement are weighted against each other based upon the known decisions made by the other countries concerning this environmental agreement. When there is a net profit, a country will join the agreement. The results of Professor Goeschl’s simulation are quite astonishing as under certain conditions only two countries (the magic number in previous research in other areas with the same model was 3) would mutually benefit from signing an international environmental agreement and hence only two countries would in effect sign the agreement. This amount of two countries is not promising and harms the belief in future environmental agreements. 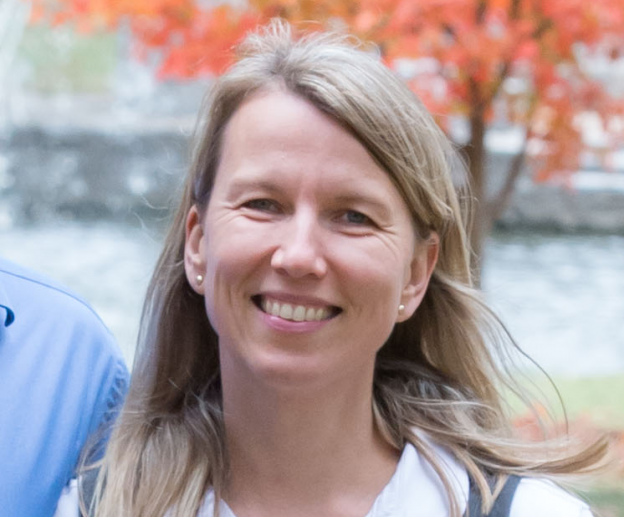 Equally surprisingly, developing green technologies by companies in industrialized countries and subsequently selling the patent rights to other countries is also not favored according to the research performed by Professor Goeschl. As the nickname ‘Green Gold’ suggests, it is commonly believed that developing such technology will deliver (massive) profits to companies and the countries in which they are located, since they are able to sell the patent rights of a ‘green’ technology that only they own. However, as Professor Goeschl argues, the benefits from global adoption (i.e. providing the technology for free to all other countries) in terms of mitigation impacts outperform the gains made by selling the patent rights to a smaller amount of countries. Combining these two findings of the research performed by Timo Goeschl, one could argue for a future in which no international environmental agreements will be agreed upon or green technologies will be developed. However, there is still hope. As already indicated previously, the model used was based on a number of assumptions, of which preeminent among them concerned the joining of an agreement only if it is in a country’s own interest. 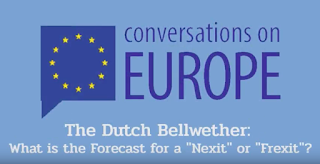 Knowing that the European Union has ambitions of becoming a world leader in the environmental field (Keleman 2010), an opportunity presents itself. 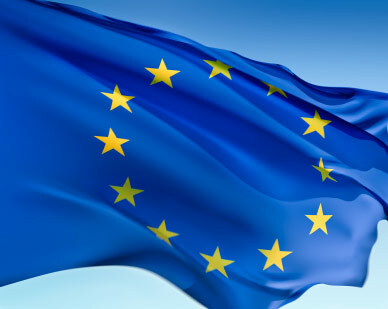 When the European Union puts aside its own interest and would be able to join the rest (or a majority) of the world in a future environmental agreement, it would reach its goal of being the world leader in environmental politics, a role it has tried to obtain since the 1980’s. Furthermore, by having a bigger amount of countries that are obliged to meet certain environmental standards, the incentives to develop green technologies will only increase. Keleman, R. Daniel. „Globalizing European Union environmental policy.” Journal of European Public Policy, 2010: 335-349. Thomas Mahieu is an exchange student from Delft University of Technology, The Netherlands, where he will start next semester with the final year of his Msc. degree in Aerospace Engineering. 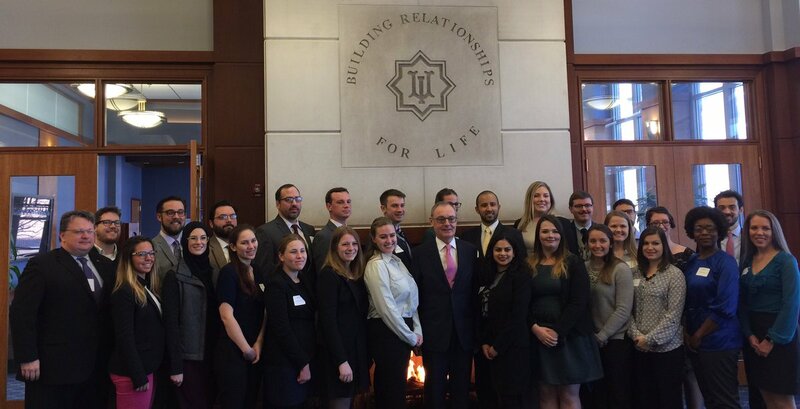 Obtaining a critical view on the European Union and its institutions at a reputable university such as the University of Illinois, including through affiliation with the EU Center, was the main goal of his exchange program. This post was originally published on the College of Liberal Arts and Sciences website on January 9, 2014.
conference in Salzburg, held at Schloss Leopoldskron (above). In one of the strangest twists in history, the wrong turn by a car in Sarajevo resulted in World War I. There had already been one attempt on the life of Franz Ferdinand, archduke of Austria-Hungary, on the morning of June 28, 1914, explains John Vasquez, LAS professor of political science. An assassin tossed a bomb at the archduke’s car, but according to one account it bounced off of the auto before exploding and injuring an officer in the car behind. Later that same day, the archduke, who was in Sarajevo to give a speech, decided to visit the wounded officer in the hospital. But along the way, the driver made a wrong turn. Realizing his mistake, Vasquez says, the driver stopped to back up at a street corner where one of the assassins just happened to be. Spotting the archduke’s car, the assassin rushed forward, pointed his gun, and shot Archduke Ferdinand and his wife, Sophie. The archduke’s last words to his wife were: “Sophie, Sophie, do not die. Live for our children.” They both died within minutes. The assassination of the archduke triggered war between Austria-Hungary and Serbia, which then escalated into a worldwide conflict. But there’s much more to the war’s origins than a wrong turn and an assassination, so University of Illinois undergraduate students will explore the complex causes of World War I in an innovative course that will take them to Vienna, Austria, for four weeks during the first summer session of 2014. The deadline to apply for the class is February 1. The timing of the course, taught by Vasquez, is ideal because 2014 marks the 100th anniversary of the start of World War I. Students will even get a chance to see World War I documents in the state archives in Vienna, and they will visit the Museum of Military History, where they can view the actual car that Archduke Ferdinand was in on that pivotal day in 1914. Austria-Hungary and Serbia were major rivals, he says, as Serbian nationalists stirred agitation over Austrian territory that contained large populations of Serbians. After the assassination of the archduke, Austria-Hungary gave Serbia an ultimatum, all of which Serbia accepted—except for one part. Austria-Hungary insisted they be allowed to come to the Serbian capital, Belgrade, and conduct their own investigation into the assassination. Serbia refused because of sovereignty issues, but the real reason was that the Serbian prime minister suspected their head of intelligence of being involved in the murder. According to Vasquez, Serbia appealed to Russia for help, while Austria-Hungary turned to its ally, Germany, for assistance, and then Russia made sure its ally, France, would support it if war broke out. The domino effect of alliances transformed the conflict into a world war, although it was almost avoided. Britain’s foreign secretary, Sir Edward Grey, and Germany’s Kaiser Wilhelm II both favored a “Halt in Belgrade Proposal” that could have prevented war. But when the Russian czar began mobilizing troops, the plan collapsed and war began. Vasquez’s class will accept up to 22 students, and each one will pick a “dyad,” or pair of countries from each side of the conflict; then they will write a paper on what brought the countries into the conflict. Vasquez has a long list of dyads from which to choose, but the major rivalries include Austria-Hungary/Serbia, Germany/Russia, and Germany/France. So Italy joined the Entente, or Allied, Powers and after the war it gained the Austrian territory it craved. Illinois students can go on an optional excursion through some of this land in northern Italy, as well as Prague and Budapest. During their four weeks in Vienna, students will be housed in dorms, and they will also travel to Salzburg for a three-day conference where they will present their papers. 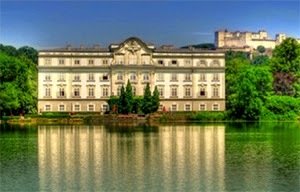 In fact, the conference will be held in Schloss Leopoldskron, the stunning palace where The Sound of Music was filmed. 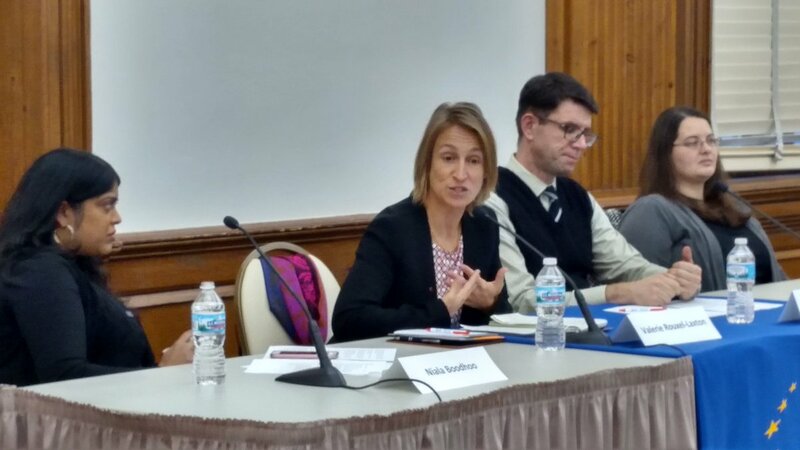 On October 4 and 5, a symposium on EU governance, supported by the EUC’s EU Center of Excellence grant, was held on the University of Illinois campus. The conference brought several scholars of the EU from around the country (plus one from the U.K.) together to analyze the European Parliament and other EU institutions. There were several political science presentations as would be expected, such as nomination procedures and legislative career paths. One lecture, however, caught all of the students’ attention: a “Comparative Analysis of Twitter Early Adoption in the United States Congress and the European Parliament” presented by Lena Surzhko-Harned from Mercyhurst University. The growing influence of social media cannot be brushed aside. There are approximately a billion Facebook users and 500 million Twitter users. The stock market plummeted in April when the Associated Press’ Twitter account was hacked and a fake message about President Obama being injured by a bombing at the White House was posted. Clearly, the power of social media can be used in positive and negative fashions. The lecture compared the first 30% of legislators/parliamentarians in both the 111th Congress and the current European Parliament to adopt Twitter. Many interesting statistics were presented, but the main point is that MEPs tweet significantly more than Congressmen, yet Congressmen have many more followers. It makes sense that Congressmen have more followers because they have more power than MEPs, are more well-known, and Congress has a longer institutional history than the European Parliament. It is less obvious why MEPs tweet so much more than Congressmen, but it could be related to the number of followers. MEPs need to work harder to attract followers and prove that they are worthy of a “follow” from Twitter users, while Congressmen do not need to put as much effort forth to get followers due to their higher status in the eyes of the public. The major issue with this study, as the speaker noted, is that it did not involve any context analysis. The real question is what are MEPs saying on Twitter? It seems like MEPs could discuss local, national, supranational, or world politics to reach different audiences and constituents. You may be able to state an opinion within Twitter’s 140 character limit, but it is difficult to provide evidence and an explanation for your opinion. All politicians can also use social media to self-promote and show a fun side of themselves to the public, like some of my examples above are clearly trying to do. My theory about MEPs on Twitter is that they spur interest in the EU for Europe’s younger generation. Not many high school students are willing to read the Financial Times to learn about the EU’s current activities, but they spend hours on Facebook and Twitter, so politicians can reach young people best on social media. A funny tweet using a popular hashtag can draw young people towards an EU official’s page, and from there, more EU-heavy content can be posted. It may not even be crucial that young people follow or interact with their MEP on Twitter, as long as the young people at least recognize that MEPs are active on social media. Those young people will remember to check Twitter later when they become more interested in the EU or politics. Mike Nelson is a second year MAEUS student. He graduated a year early and received his Bachelor’s degree in Political Science from the University of Illinois at Urbana-Champaign in 2012. Mike has studied French, German, and Spanish and will be tackling Swedish starting this fall. He has traveled to Germany and hosted a French foreign exchange student. During the summer, he works as a manager at a water park. He is working as a Graduate Assistant and Teaching Assistant for the European Union Center this year.